Congregation Beth Israel of Colleyville joined forces with Carter BloodCare for its summer blood drive Sunday. Turnout was very good, according to Barry Klompus, who helped coordinate the drive. “We have a full bus,” he said. The event took place in its well-marked — and large — RV-like bus. “Considering it’s summer and a lot of congregants and their friends are on vacation, I feel very good about this,” Barry said. He added a fair number of walk-ins participated, in addition to those who scheduled advance appointments — also a good piece of news. Kudos and thanks to those who took an hour or so of their time to donate blood. Donating is a life-saving measure and will provide needed assistance for those in need of it. A true mitzvah, indeed. Rishi Gurevitch, rebbetzin at Chabad of Arlington, writes that the Chabad is very busy with many activities at Camp Gan Israel this summer. One of those activities ended up being a colorful table and bench created by the campers, geared specifically to be put on display, through a silent auction. 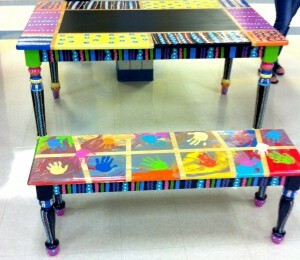 That table and bench is now available, with the proceeds going toward Camp Gan Izzy programming. According to Blanca Sherwin, the Chabad’s art teacher, the idea behind creating these items was to teach the kids about mitzvah. The children understood they were doing a mitzvah — decorating and creating this table and bench — for the purpose of raising needed funds. Those interested can log onto cgiarlington.blogspot.com — at last check, the most recent bid on the table was $340, with the bench having a bid of $160. Bidding will end Aug. 1, so if you’re interested, hustle over to the website and check it out yourself. Though a variety of Jewish organizations take time off during this time of year, it seems as though Hadassah’s Fort Worth chapter has been working behind the scenes to offer some interesting programming to take place during the next few months. The first event, taking place at 7 p.m., Sunday, Aug. 26, is “Beat the Heat with Hadassah,” which will take place in the home and studio of Etty Horowitz. In addition to viewing some pretty nifty art, participants will be able to make ice cream sandwiches. The cost is only $10, but an RSVP is necessary (to make sure there are enough ice cream and cookies on hand). For information, contact Jane Guzman Pawgan at 817-292-5778 or email her at drjaneguzman@aol.com. Further on down the road, Hadassah will sponsor a “Shir and Schmooze with Shoshana and Sheri.” “Shoshana” refers to Cantor Shoshana Abrams, who just took up her duties at Congregation Ahavath Sholom in Fort Worth. The “Sheri” in the duo is Cantor Sheri Allen, who does duty for Congregation Beth Shalom in Arlington and has for a number of years. Also on hand will be sisters Rhoda Bernstein and Laurie Werner, who will discuss the dedication of the Madlyn Barnett Memorial Wing at Hadassah Hospital (due to take place during Hadassah’s centennial celebration this October in Israel), which is named for their late mother. The local event is scheduled for Sunday, Nov. 11, at a to-be-determined location. May you have many more blessed years as couples. I’m hearing from a lot of folks out there who say they’re going to/have gone to some pretty cool places this summer. This is terrific — I’d like to know more about it. Please send information about your travels (along with a photo or two) to me at awsorter@yahoo.com. Thanks!